How Far is VVIP Meridian Towers? Adore a life of ease and elegance at VVIP Meridian Towers, a place where extravagance meets tranquility. Wrapped in a classy environment are high-end luxury flats that fulfill the need for an aspirational lifestyle. 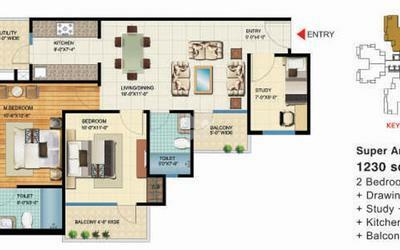 The property offers 2BHK, 3BHK and 4BHK apartments and shops that are required for a comfortable stay of residents which add a new dimension to the definition of opulence. Door Frame: Wooden Door Frame. External Door: UPVC/Powder coated Aluminium Sliding Doors. Main Door: Teak Wood Veneer finished Door with Brass Fittings. Flooring: Overall 600mm x 600mm vetrified Tiles. Toilet: Designer glazed tiles up to 7ft. ht. with matching Ceramic ware and C.P. Fittings, Antiskid floor tiles. Kitchen: Granite Platform Steel Sink, Glazed Tiles in Dado upto 2'0” from platform. Door Shutters: Factory made flush doors. Window Frame/Shutters: Powder Coated Aluminum Section with glass. Water Supply: Concealed water lines with standard quality fittings. Jaquar / Kohler as equivalent. Electrical: Concealed copper wiring with standard quality fittings, boards & switches. Painting: External wall finished with cements based paints, internal wall with oil bound distemper. P.O.P. Cornice in Drawing/Dinning. Enamel Paint on steel work. Boundary: Gated boundary wall complex. Security: Exclusive Guard at main entrance lobby with card access system in lifts. 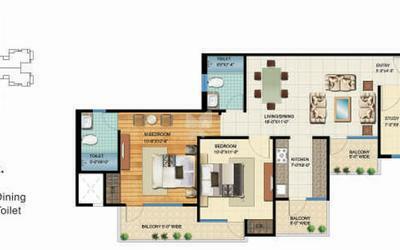 Vibhor Vaibhav Infrahome Pvt. Ltd., popularly known as VVIP, is a renowned name that excelled into prominence over a decade in the real estate sector. It is built on dedication, dynamism and expertise. The vision and foresight of Mr. Praveen Tyagi, CMD, is to make available world class luxury homes equipped with all the amenities to its people. VVIP Group has worked diligently in this direction to augment the lifestyle of the people under his esteemed guidance and leadership. VVIP Addresses-'VVIP Addresses’ at Rajnagar Extension, Ghaziabad built on 25 acres area with 2/3/4 bhk and exclusive duplexes.Its immense success was a path breaking event in luxury homes space. 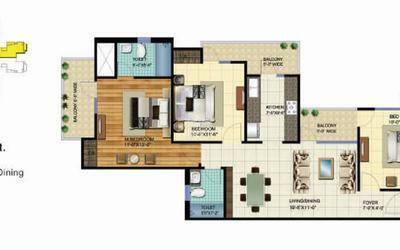 VVIP Addresses had world class architectural design, superior technology and all the amenities for luxury living. Its landscape décor had added impeccable beauty and value to its esteemed occupants. Jogging tracks, kid zone, garden, exclusive club house and swimming pool to name a few. ‘CRICKET STADIUM’ for day-night matches and cricket academy by ace cricketer Suresh Raina as its brand ambassador and association with bowling legend Kapil Dev was the ultimate highlight. Elegantly Built, Innovatively structured and Spaciously planned living spaces is ready for possession. VVIP Homes-The legacy of ‘VVIP Addresses’ now comes to Greater Noida West with ‘VVIP Homes’ an exclusive, resplendent offering to augment the living style in the most subtle way. VVIP Homes is a podium based project with ample parking space and free from noise pollution. Built on total 8 acres area, 2 sides open and 81% open area. 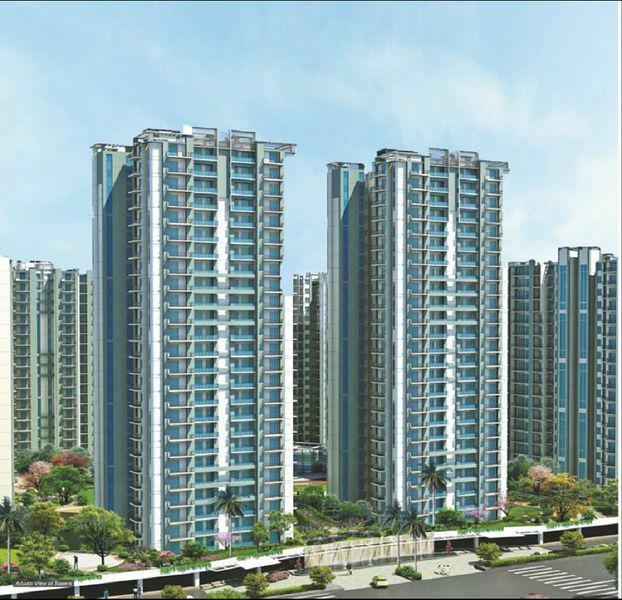 2, 3 & 4 BHK will be constructed and have two iconic towers of 24 plus ground floor and rest 18 plus ground floor respectively. Its vicinity from NH-24 is 2.8 km and easily accessible to other destinations. ‘Club House’ is the helm of this entire gamut. The aesthetic design and vibrant atmosphere makes it the ideal place for recreation and peace of mind. It is fully loaded with indoor games, in-house theatre, ultra modern gymnasium, spa & sauna for complete relaxation and rejuvenation. VVIP Style- ‘The VVIP Style’ exuberant shopping complex is with Cineplex, food court, Anchor, Super Market, Shops, Office spaces with world class amenities. Fully loaded high end residences wrapped in a luxurious architecture for people passionate about affluent living. The rich legacy of VVIP continues towards luxurious living. Be a VVIP today to live your dream.